The Femme Conference 2010: No Restrictions in Oakland is just one week away! And in honor, Sugarbutch is counting down to the Femme Conference, featuring some important femme books that I highly recommend if you haven’t read them already. Femme is part of an ever-evolving, big, knowable lineage, and if you love this identity in any way—if it’s yours, or if it is the gender to whom you are oriented, or if you appreciate it—you should know where it comes from, where it’s been. News from the Femme Conference this week: the Femme Conference Schedule has been announced, and in addition to Kate Bornstein’s keynote, Moki Macías, a queer femme organizer and community planner in Atlanta, will also be doing a keynote. And the Conference is only one week away! So now, on to the book. 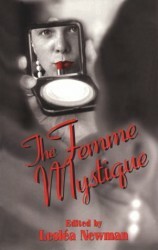 Have you read The Femme Mystique, edited by Lesléa Newman and published by Alyson Books in 1995? It was the first book on femme identity that I came across, and I picked up a copy at Powell’s when I was in Portland in July. Re-reading parts of it is kind of like re-reading my own journals from ten years ago, so familiar are the words and perspectives. So I’m particularly fond of this book because of the nostalgia, because of how formative this collection was for me. Coming out into communities which were ruled by queer femmes (well, at least, they sure seemed to be from my perspective), I think I’ve been a little blind to the ways that the queer scenes can trivialize the feminine, but as a women studies student and as someone who is simply aware of sexism and misogyny in this world, obviously that is entirely true and relevant. It continues to surprise me. Like, the doctor at the queer health clinic gave you a pregnancy test, even after you told her you were gay? Really? That just doesn’t even make any sense. But hey, that doesn’t mean it doesn’t happen. The more recent anthologies are much higher quality, I think, both in the choice and arrangement of the essays and the quality of writing, but every once in a while there is a serious gem. Some folks have criticized this as being repetitive, which I also do understand, but that also speaks to how common and communal these perspectives on queer femme identity are. You’re likely to recognize some of the authors—Chrystos, Tristan Taormino, Kitty Tsui—but there are plenty more I’m not familiar with. The book is peppered with photographs, many of them very clearly 1980s versions of femininity (press on nails, lace, extensive makeup) which is interesting, that femme can be so closely tied to female fashion trends. There is a lot of identity alignment assumptions in this collection—a lot of women talking about cooking, cleaning, “traditionally female” activities. It’s interesting how much we as a culture have broken that in the last fifteen years, even. Even though the women in these photos are probably in their 20s and early 30s, which is my age, they seem so much older … probably because my brain automatically does the calculation: “If they are 25 in 1990, they are 12 years older than me and are now in the early 40s.” It takes some intentional undoing to think, these people in these essays, in these photographs, are my age, and were at that time figuring out the same things I am now figuring out. And also … are you ready for the Femme Conference!? I can’t wait to hear all about it on Twitter and other blogs! Who’s going to be writing about it? Who’s going to be live-Tweeting? Keep me updated, please! I have that book, and was 24 when it was published. Never did press on nails, and hadn't done lots of make-up since I was 14/15, but I did very much appreciate reading it. Which newer anthologies do you recommend? It's great that the femme/butch world you travel in has eased away from 'chore' roles, but I assure you, there's still a lot of baggage around who cooks, who cleans, who fixes things, etc. On other topics — glad you're examining reliance on alcohol, always a good thing. I also find big, expensive cities stressful, even with all their joys, so I understand the pull.